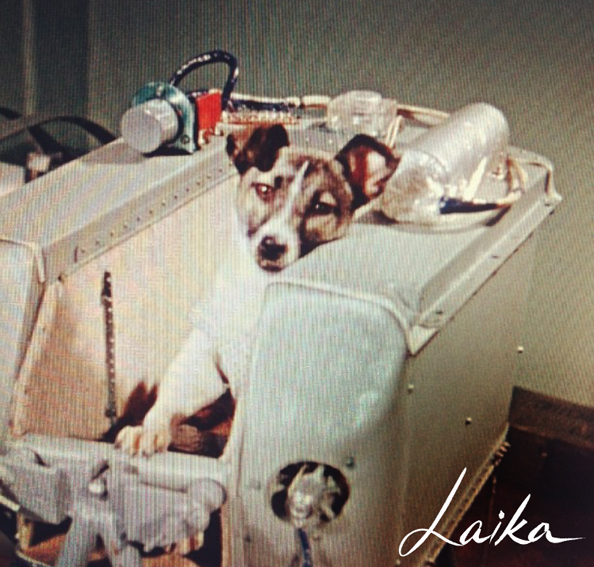 On November 3, 1957, Laika became the first living being to orbit the Earth. She was launched on Sputnik 2 as part of the Soviet space exploration program, with the USSR locked in a heated race against the United States to conquer space. A stray mutt from the streets of Moscow, Laika was described as being calm and quiet, complying obediently with her training. It included standing still for long periods of time, wearing space suits, being placed in simulators that acted like a rocket during launch, riding in centrifuges that simulated the high acceleration of a rocket launch and being kept in progressively smaller cages to prepare her for the confines of the space module. Oblivious to the plans set in place for her, Laika unequivocally trusted her caretakers, who ended up betraying her. The space shuttle was designed to not be retrievable. Laika in the midst of her training. She died within hours of the launch from extreme stress and overheating. Her heart was beating at triple its normal rate, and she was subjected to temperatures topping 100 degrees Fahrenheit as the capsule’s cooling system proved to be ineffective. Sputnik 2 continued to orbit the Earth for five months with her remains, disintegrating upon reentry into the atmosphere. 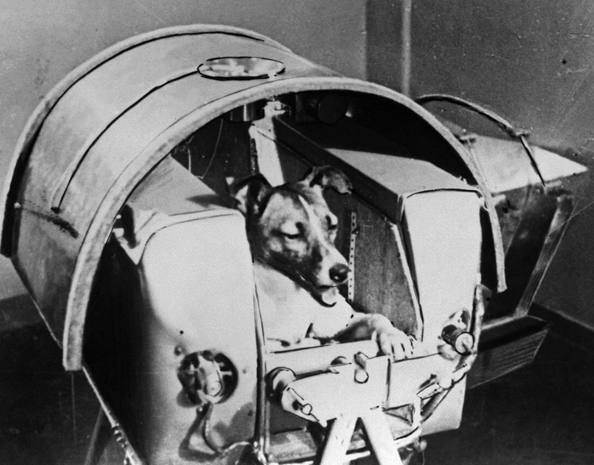 Altogether, the USSR sent 48 dogs into space. 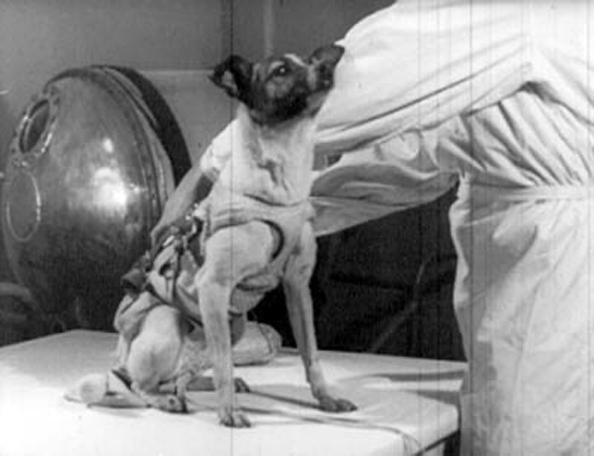 Three years after Laika’s launch, Oleg Gazenko, a senior Soviet scientist involved in the project, adopted a dog from another space mission – Krasavka. She lived out the rest of her life with his family for 14 years. Gazenko carried the guilt of sending Laika to her death for decades. “The more time passes, the more I’m sorry about it. We shouldn’t have done it. We did not learn enough from this mission to justify the death of the dog,” he stated during a Moscow press conference in 1998. “When you understand that you can’t bring back Laika, that she perishes out there, and that no one can bring her back…that is a very heavy feeling. After I returned to Moscow from the launch, I left town. I wanted to isolate myself,” he told a Russian reporter. Laika in her capsule, in preparation for her launch. During many years of Soviet state propaganda, Laika’s launch into space was deemed an act of heroism, as though she had given her consent to participate. Her likeness was used to sell everything from cigarette cartons to children’s toys, and monuments were erected in her honor. 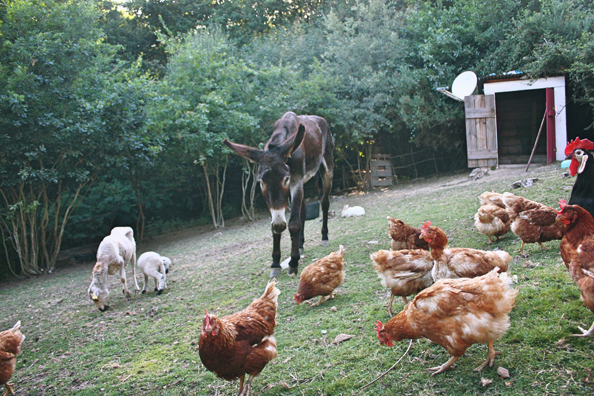 Each year, over 50 billion farm animals are killed around the world – nearly eight times the human population. These numbers do not include the billions used for fashion, sport and entertainment. Their suffering is as profound as Laika’s, but they are not lauded as heroes. Just like Laika, they are commodities, used to sell products – themselves turned into products, their needs disregarded and their status as sentient beings erased. 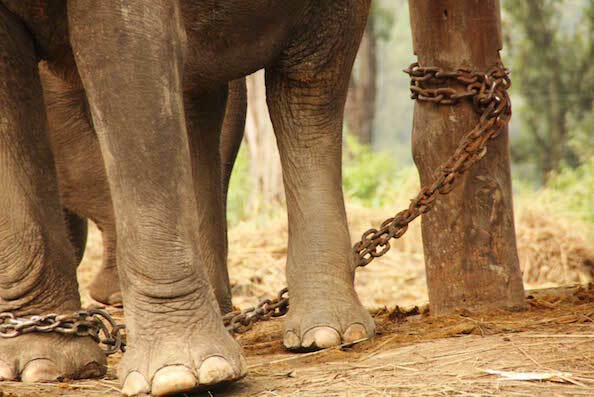 Chained elephants in Nepal, awaiting to be used for elephant rides. 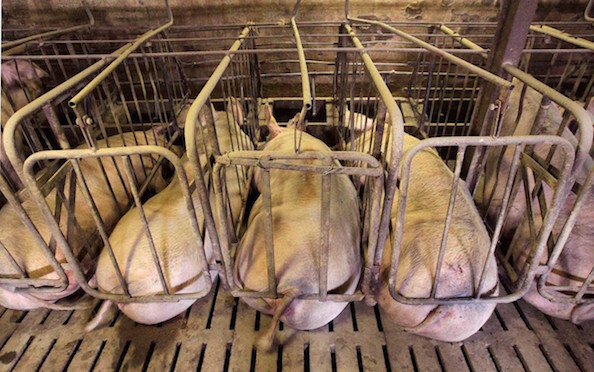 Pigs kept in gestation crates in the United States, unable to turn around or stand up. Laika’s story represents not only the continued needless exploitation of animals at the hands of humans, but our paradoxical and arrogant relationship with them. In their innocence and vulnerability, they look to us for mercy and protection. But we betray them. And with this, we chip away at our conscience. There is no gain in exploiting other living beings, there is only loss — the loss of our humanity. 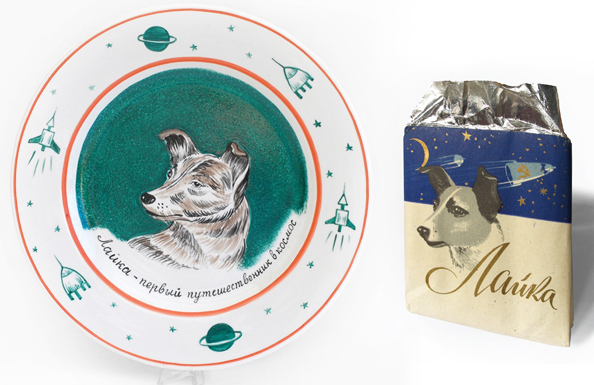 LAIKA magazine is a tribute to Laika the space dog and to all animals treated unjustly. It is a message of hope that we can repair and rebuild our relationship with our fellow earthlings. In the pages of LAIKA lies the proof that it is entirely possible to live a life free of harming others. This life is possible for each one of us, thanks to our innate sense of compassion and our ability to discern between right and wrong. Veganism simply means allowing compassion and justice to transcend the boundaries between species. 23 million chickens are killed in the U.S. for food every day. Or, 269 per second. Each year in New York, 50 thousand chickens are trucked in from factory farms to be sacrificed in a religious ritual called Kaporos. Penelope was one of those chickens. She was born into industrial farming as a “broiler,” a term used for chickens raised for meat. Selectively bred by people to grow unnaturally large in a very short time, they are slaughtered at 6 weeks, still peeping like babies. It was around this age that young Penelope was put on a truck bound for New York. Kapparot, also spelled Kaporos, is practiced by some segments of the Ultra-Orthodox population, but remains largely unknown to many Jews. It involves participants “atoning” for their sins by swinging live chickens over their heads three times while chanting a prayer. The chickens are then slaughtered in makeshift slaughterhouses on sidewalks. 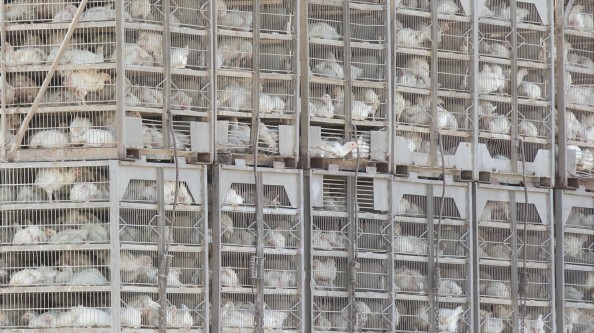 Thousands die while awaiting this procedure from being tightly packed together and stacked high in crates, exposed to the elements and denied food and water. The ones who make it past this stage are pulled from the crates with their wings pinned back, causing excruciating pain from breakage and torn ligaments. Dead and dying chickens, blood, excrement and garbage are left strewn around on public streets following the ritual, with no oversight for cleanup. Not long after her rescue, Penelope was stricken with Mareks disease, a potentially deadly virus in chickens, that rendered her legs immobile. But she fought her way back, determined to live. “She actually dodged death about four times,” says Vanessa. “When she was unable to walk, it was clear that it freaked her out. She tried so much to push herself up with her wings that the ends became bloodied, and we had to wrap them. She is a very strong soul. I think all animals want to be here just as much as human beings do.” Today, Penelope is thriving in the Dawson household, along with the couple’s two rescued cats and a rabbit, who have not only accepted her, but befriended her. 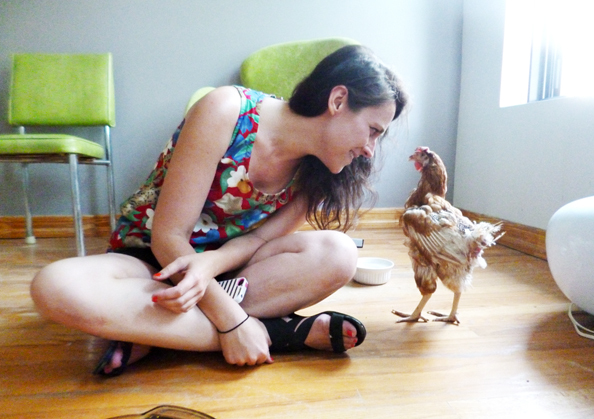 “She is one of the sweetest, friendliest and most loving beings I have ever met,” Vanessa says of Penelope. “She will follow us all around the house. She waits for us by the door when we leave, which totally breaks our hearts. She will crawl up into your lap. She is kind to everyone who walks through our door. She is a good judge of character — like people would say about their dogs.” Earlier this year, Penelope was the subject of a short documentary by filmmaker Duncan Skiles. Rina Deych is co-founder of the organization Alliance to End Chicken as Kaporos and has been protesting the use of chickens in Kaporos since the 1990s. A life-long resident of Borough Park, where every year at least eight Kaporos sites are erected within a 10 block radius, she comes from 18 generations of rabbis. “Many rabbis point out that the ritual, which is not mentioned in the Torah or Talmud, violates several mandates and imperatives in both works, not the least of which is “Tza’ar Ba’alei Chayim”, the Torah mandate not to cause suffering to animals,” Deych told LAIKA. 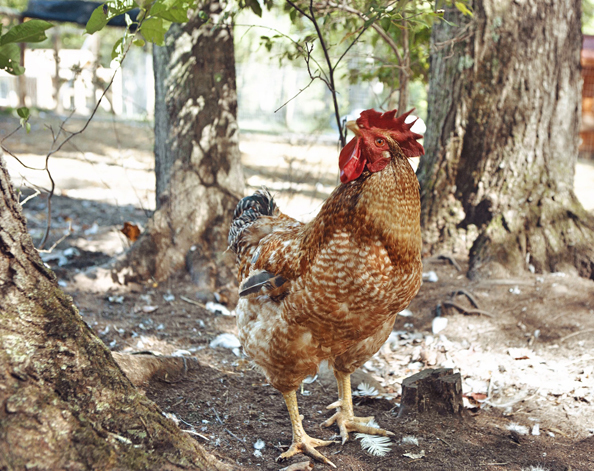 Since the ritual’s resurgence in the 1970s, an increasing number of Orthodox rabbis have spoken out against it, urging the use of coins instead of chickens. In July of this year, the Alliance, along with 20 additional plaintiffs including area residents, concerned individuals and activists, filed a lawsuit in the New York Supreme Court New York to issue an injunction against Hasidic rabbis and synagogues in Brooklyn from using chickens in Kaporos. “I think people are under the misconception that the First Amendment, which does assure religious freedom, protects anything done in the name of religion. It doesn’t,” said Deych. “It protects freedom of belief, thought, not action. One still must work within the confines of the law.” The plaintiffs argued that the ritual is a public nuisance that violates multiple health and animal cruelty laws. On September 14, a state judge dismissed the case, saying that it was up to city officials to enforce sanitary codes. The ritual was allowed to proceed again, with hundreds of people converging in Brooklyn to protest the bloodbath. Another court hearing will take place next month to address other illegalities connected to the practice. A registered nurse of 36 years and a new grandmother, Deych is deeply concerned about the public risks posed by the unsanitary and hazardous conditions of the ritual. “Aside from the obvious unimaginable suffering involved, with avian flu, salmonella, and other zoonotic diseases in the news these days, these operations are inviting a huge potential health crisis,” she says. And while practitioners claim that the slaughtered chickens are donated to the poor, activists have repeatedly documented dead chickens discarded into trash bags and thrown away. With thousands of chickens trucked into New York City for Kaporos, and each bird sold to practitioners for about $12, area synagogues rake in millions, making the torture and killing of chickens a lucrative business. The same holds true for the rest of the world, year-round. Chickens make up 95% of all land animals slaughtered for food: 50 billion are killed globally. In the US, sales of poultry exceeded $40 billion in 2013. Chicken processors are among the country’s richest companies. Koch Foods, for example, made $3 billion in revenue last year. Each week, they slaughter, ship and sell 12 million chickens. Its CEO Joseph Grendys is a billionaire. Companies like Koch also exploit the vulnerability of their predominantly immigrant, rural, poor and uneducated labor force. The undocumented immigrants among them are stripped of virtually all workers rights. Similarly, the chickens that are killed by the workers are excluded from the federal Humane Methods of Slaughter Act, which cultivates a climate of rampant animal abuse. Butler’s stories blew the lid off industrial chicken farming and inspired countless readers to change their eating habits, including then-Cornell University senior Josh Tetrick, who became vegan thanks to the blog. “Before reading it, I never thought about how meat came to be on my plate,” he told the LA Times in 2003. Tetrick went on to found Hampton Creek, a vegan food startup with a hugely popular flagship product, Beyond Mayo. His company was recently subjected to an attempted takedown by the USDA-appointed American Egg Board, who were worried about Hampton Creek’s impact on the U.S. egg industry. For Tyson, one of the largest chicken producers in the US with 45 slaughterhouses in operation, as well as other chicken processors, it’s still business as usual. In September, the non-profit Animal Legal Defense Fund released undercover video footage taken inside a Tyson slaughter plant in Carthage, Texas that showed systematic abuse of both animals and workers. And it’s just one of many (in July, the animal advocacy organization Mercy For Animals exposed horrific conditions at a chicken farm that contracts with Tyson). 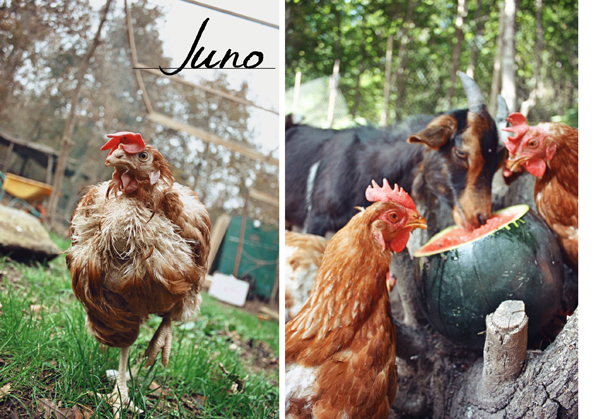 Juno was on her way to slaughter, when the truck she was on overturned on a highway in Spain last December. Thousands of chickens tumbled out, most of them still trapped inside their cages. Activists from nearby Leon Vegano Animal Sanctuary rushed to the scene, finding mangled and dead birds crushed in cages; those strewn across the road were being grabbed by locals to take home and eat. Yet amidst the devastation, 314 were still managed to be saved, making this the biggest animal rescue in Spain’s history. “When we heard about what had happened, we drove through the night to bring as many as we could fit in our car back here,” recalls Abigail Geer to LAIKA, who is the co-founder of Mino Valley Farm Sanctuary in Galicia, Northern Spain. Juno was among the 45 lucky ones brought to the sanctuary. “If you’re having a bad day, just go near Ellie, and you’ll feel better,” Wendy Stura tells LAIKA. Along with her husband Michael, she runs Skylands Animal Sanctuary in Wantage, NJ, where the doting copper-hued hen resides. 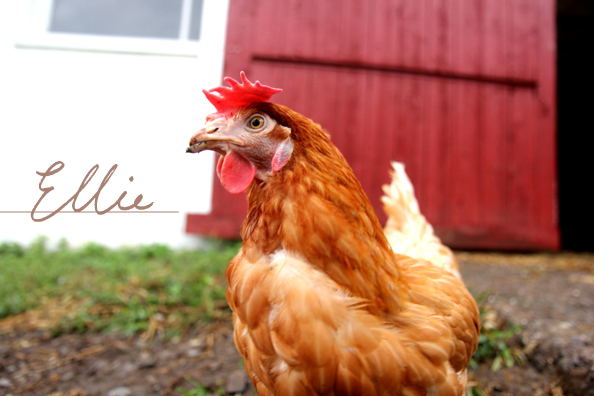 “Ellie is definitely a ‘people chicken’,” says Wendy. It’s a remarkable characteristic, given all she had endured at the hands of people before her rescue last summer. 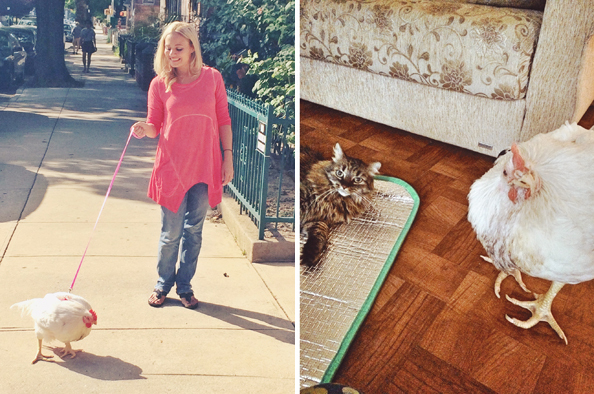 In spite of being emaciated and exhausted, Ellie relished life. “Ellie’s joy in eating and being stroked on her head showed that she wanted to live,” recalls Lori. “She loved berries and squash and wanted to be petted, and she preened my hair.” When Barrett gave her a bath, Ellie responded to being gently blow-dried with pleasure. After spending a week with Lori in Brooklyn, she went on to a more permanent home at Skylands. 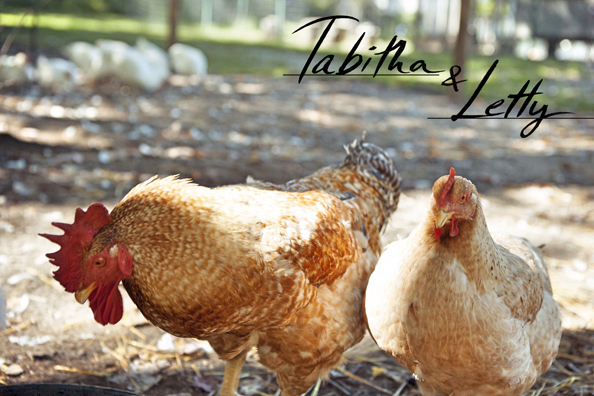 Tabitha and Letty are two chickens who went to college. Well, sort of. Last fall in her senior year at Vassar College in Poughkeepsie, NY, long-time vegan Rocky Schwartz learned online of two young chickens who were going to be slaughtered unless they found a home. 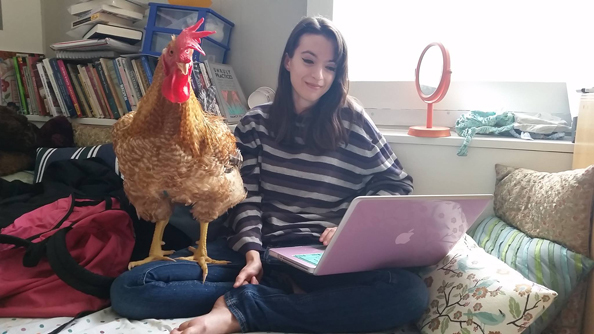 Rocky plugged into the Facebook group “Vegans with Chickens” for some advice and, given her large dorm room, knowledge of chicken care basics and the life-or-death nature of the situation, decided that Tabitha the rooster and Letty the hen would become her indoor roommates until the spring. Throughout the winter, Tabitha and Letty loved perching themselves on Rocky’s bed to watch the snow fall outside the window. “They also loved it when I’d bring in a bowl of snow for them to munch on as a special treat,” remembers Rocky. Top image of Penelope and Vanessa Dawson is a still from Penelope: A Rescue Story by Duncan Stiles. ISSUE FIVE of LAIKA is Here, Featuring David Carter! DEAREST READERS, WE ARE THRILLED TO BRING YOU OUR FIFTH ISSUE! This, “The Strength Issue,” is an assertion of the cutting-edge activism, bold creativity, formidable athleticism and fearless innovation that is encompassed in compassionate living. 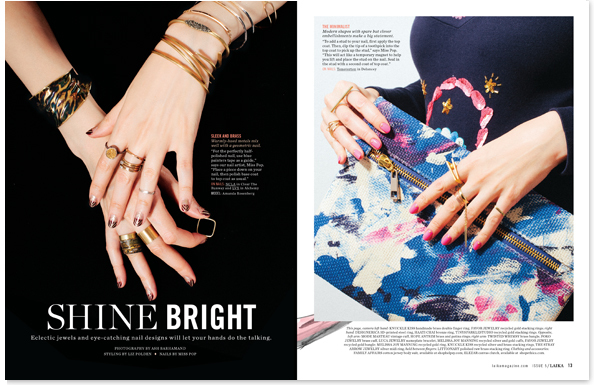 Pick up a copy or subscribe to the gorgeous sustainably-produced print edition or the digital version now. 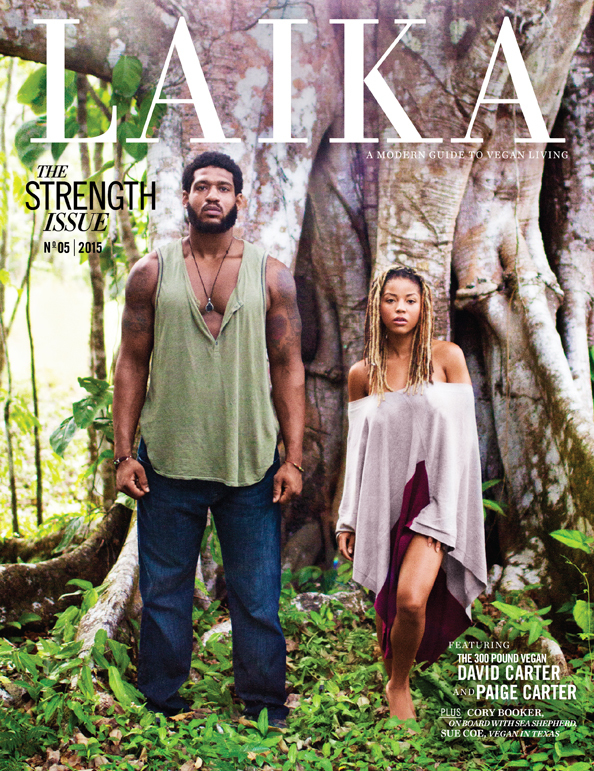 Gracing the cover is NFL defensive lineman David Carter, known as The 300 Pound Vegan, who is deconstructing every known myth about veganism and using his stature to speak up for animals. Alongside him is his wife, and fellow animal rights activist, Paige Carter. In our uplifting profile, they open up about their vegan journey, their natural lifestyle, David’s intense training routine and his rise as an influential activist. As the feature’s photographer, Paige shot the stunning cover of her and David in Costa Rica as a self-portrait — a LAIKA first. 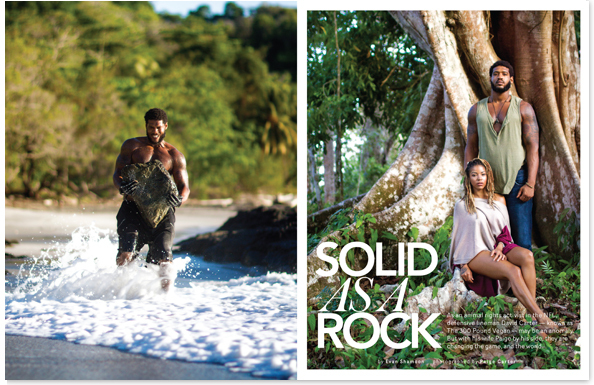 We bring together doers and thinkers who epitomize strength of character and perseverance. 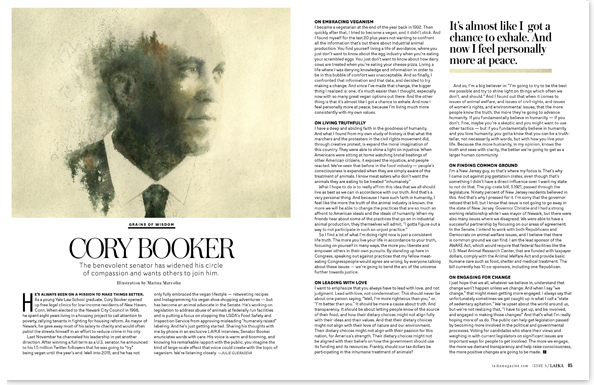 Like captivating Senator Cory Booker, who shares his thoughts on veganism and living truthfully in our exclusive interview. 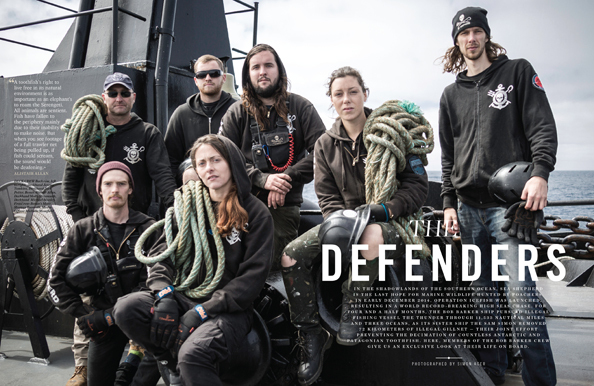 The vegan crew of Sea Shepherd’s the Bob Barker ship give us an unprecedented look into their lives during the groundbreaking four-and-a-half month long Operation Icefish campaign in Antarctica, which demonstrated their endurance and determination. 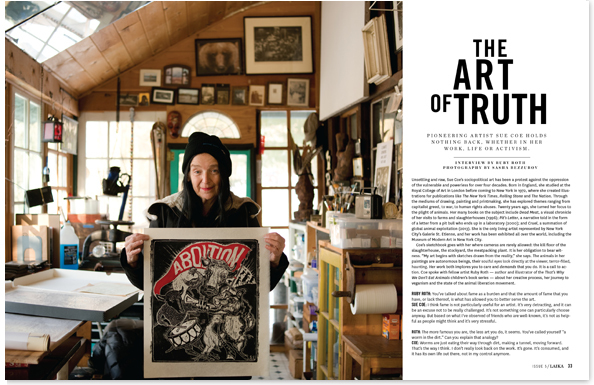 We delve deep into the brilliant mind of pioneering sociopolitical artist Sue Coe, interviewed by fellow tide-shifting vegan artist, Ruby Roth. With the same level of in-depth coverage, we tell the stories of our animal compatriots. 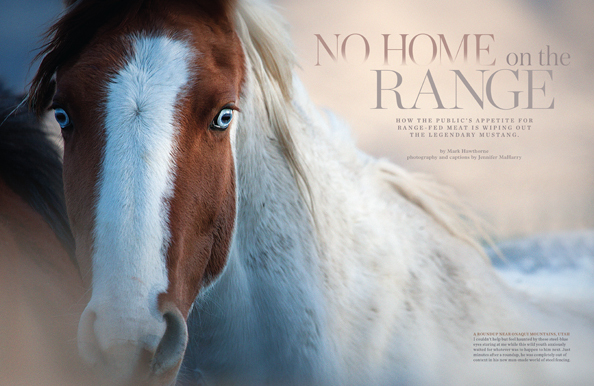 Like in “No Home on the Range,” our 10 page special report and photo essay on the peril of wild horses, themselves a symbol of strength, now being eradicated to accommodate America’s appetite for “range-fed” meat. Yet our feature “Freeborn,” which tells the rare stories of animals born into freedom, and of pig-farmer-turned-vegan Bob Comis, shows how liberating it is when living beings are allowed to become their fullest selves. As always, we bring you gorgeous and unique stories on vegan style and beauty, and take you around the world in in-depth travel and food features. In this issue, we hop over to Germany, zoom down to Costa Rica, cross the globe to Australia, and explore the United States! 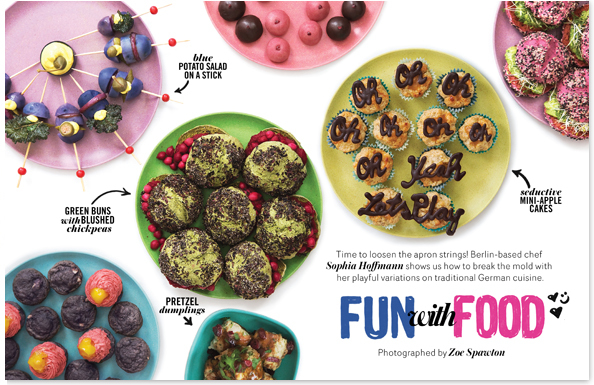 We spotlight the hottest restaurants and the dynamic personalities behind them; share amazing and one-of-a-kind recipes; and delight you with the latest product discoveries.